Sometimes when you’re writing a book, it’s hard to keep your motivation going – so why not get a little help from your computer? Jutoh already shows your total word count in the status bar and in the Word Count dialog, and you can also ask Jutoh to let you know when you’ve written a certain number of words. a relative number of words written from now, such as 2000. You can give them names, such as “Half Way” or “Daily”. 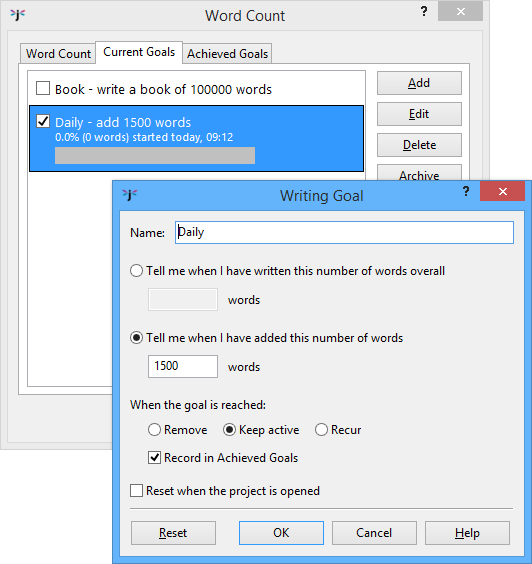 A “Daily” goal is added to the project by default, so you just have to edit it, specify the number of words you hope to write, and restart the word counter (if at the start of a new day). If you wish, you can also add a weekly and monthly targets – just remember to restart them at the beginning of each time period. You can get Jutoh to restart a target when you open the project by checking Reset when the project is opened in the goal properties. You will be told when any of these goals have been achieved. If a relative number of words, you can specify that this goal will recur, so that you will be informed whenever you have written another (say) 2000 words. 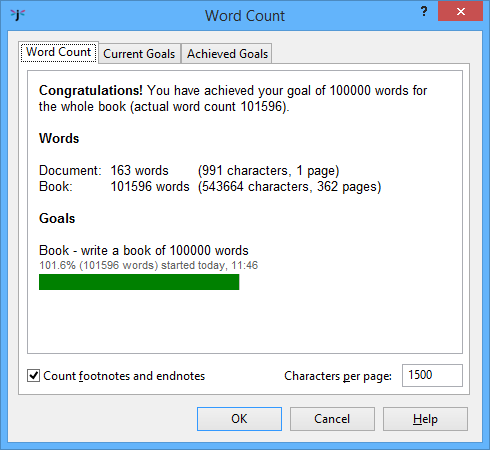 Word Count, showing the word count for the active document, the whole project, and the selected text if any, along with a summary of the progress of any active goals. Current Goals, showing you the current goals. The current goals will only be considered if they are enabled using the checkbox on the left of each item. The total book word count goal is always present and cannot be deleted. 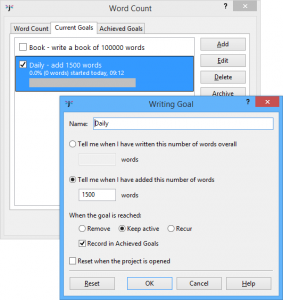 Goals are added or edited using the Writing goal properties dialog. Achieved Goals, showing a history of achieved goals. You may be interested in how many words you have written since a certain point in time. Jutoh will show you how many words you have written since you achieved a goal. You can also add ‘landmarks’ in the Achieved Goals page: click Landmark and optionally enter a custom name, to add an item that will show you how much you have written since that point. For example, you could add a landmark every week or at the beginning of the day.